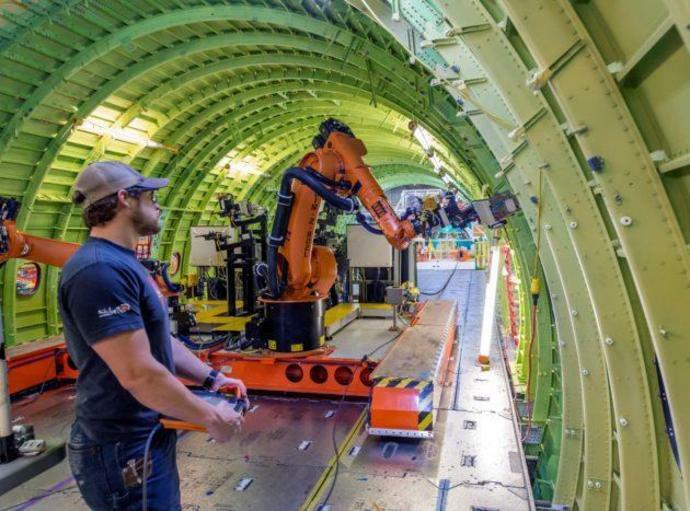 Boeing's moves to automate its manufacturing processes and streamline the quality assurance process for its airplanes has sparked discussions with union officials over the effect on jobs. The controversy came to light in the current issue of Aero Mechanic - the newspaper published by the International Association of Machinists' District 751, which represents Boeing assembly workers - and in The Seattle Times. Union leaders are concerned about a Boeing campaign known as "Quality Transformation," which relies on automated processes such as robotic riveting and precision machining to cut down on manufacturing defects. Boeing says such processes make airplane assembly more "mistake-proof." Aero Mechanic said Boeing laid out its plans and their potential effect on quality-assurance jobs in November. "Per the PowerPoint Boeing presented to our union, Boeing estimates their plan will impact 451 QA jobs next year and potentially a similar amount in 2020," the newspaper reported. "This will not only place a heavier burden on our mechanics but will also eliminate the second set of eyes on thousands of work packages." Boeing currently has more than 3,000 quality inspectors, The Seattle Times said. During a series of meetings last month, Machinists Union District 751 asked its members to document occasions when they were discouraged from reporting problems on the assembly floor. "The company is taking advantage of QA and manufacturing working together essentially masking defects and coming back later with a 'risk assessment process' to eliminate inspections where there were no documented defects," the Aero Mechanic report claimed. The union calls its counter-campaign "Not OK to Cut QA." We've reached out to Machinists Union District 751 for further comment and will pass along any information we get.